The Department of Dance is a community of diverse individuals trained on a common nexus of inquiry, the rich and complex phenomenon of dance. At the heart of the Ohio State dance experience is the notion of embodied scholarship, embracing the intertwining areas of movement practice, creative activity and theoretical inquiry. As one of the premiere dance programs in U.S., the Ohio State Department of Dance is at the forefront of contemporary modern dance through choreographic and performance exploration, creative use of technologies and reimagining the documentation of dance traditions. Visiting artists and scholars enrich all dimensions of the program and regularly augment the resident faculty. The bachelor of fine arts (BFA) in dance provides a comprehensive education across the field of contemporary modern dance with a core focus on the dancing experience. The dance minor is organized to merge course work in three core areas — creative activity, theoretical inquiry and physical practice. For more information visit the Department of Dance website or view the university's major curriculum sheet. Have a question about Dance or want more information? Let us know. The BFA in Dance provides a comprehensive education across the field of contemporary dance with a core focus on the dancing experience. An accredited member of the National Association of Schools of Dance, the Department of Dance offers students rigorous training at the intersection of movement practice, creative activity and theoretical inquiry. The BFA curriculum provides a solid foundation in movement practice, performance, choreography, history/theory/literature, analysis, dance education, kinesiology, production and technology. Ohio State has produced graduates of high caliber who have gone on to successful performing careers with the Paul Taylor Dance Company, Twyla Tharp Dance Company, Merce Cunningham Company, Mark Morris Dance Group, Dayton Contemporary Dance Company, Pilobolus, David Parsons, Ron Brown, Stephen Petronio, Sweden’s Cullberg Dance Company and Israel’s Batsheva Dance Company. Others such as Senta Driver, Dianne McIntyre, Lynn Dally, Bebe Miller and Timothy Buckley have built successful careers as choreographers. Ohio State students have also gone on to careers as dance notators, historians, movement analysts or specialists in dance productions. This lecture-based Second-Level Writing General Education (GE) course uses language to engage students in the viewing, describing, critiquing and appreciation of the art form of dance. Dance 2367 is open to all Ohio State students. This studio-based course in movement practice lies at the heart of the Department of Dance's mission to develop skills and appreciation for contemporary dance, including established modern dance techniques and the expansion of unique, new movement vocabularies. Our dancers successfully navigate a wide range of technical styles. Coursework is available in elective, minor, and major programs. 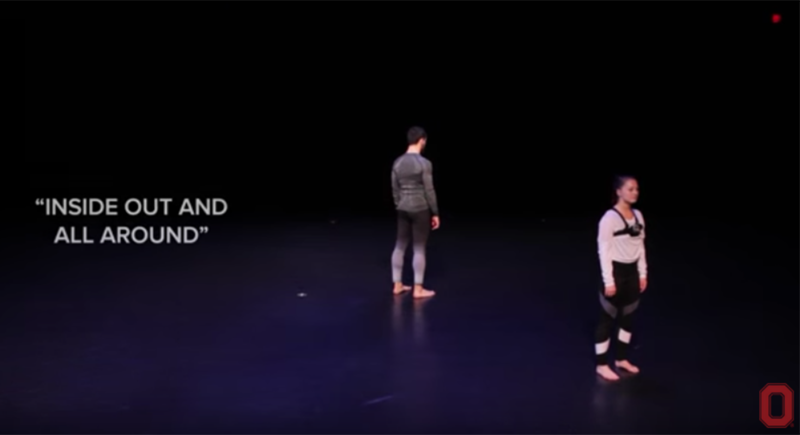 Composition explores the creative process of dance making. Coursework is available in elective, minor and major programs. The program for majors is an in-depth yearlong experience; additional higher-level courses are offered for upperclassmen. The study of improvisation nurtures the creative process and strengthens movement range and fluency. Through the physical embodiment of movement, students develop a sense of community and engage in critical thinking and problem solving. An introduction to creating short films of dance made specifically for the camera. Basics of camera and Final Cut Pro are taught as three film projects are created. Prereq: Jr standing, and enrollment in Dance major; or grad standing; or permission of instructor. Asha Whitfield, a senior dance major, traveled with a group of 11 dance majors — nine undergraduates and two graduate students — to Salvador, Brazil, to perform and to engage with Brazil's rich culture. The ensemble of dancers performed in schools, community centers, studios and theatres around Salvador. Everywhere the Brazil tour went, they were greeted by enthusiastic audiences who were more than willing to share their own dances with the company. "To me, the overarching effect of studying abroad — any time I go abroad or take the steps to learn about another culture — is that I learn a lot about me, what I value and my identity. The more I take time to learn about someone or something else, the more I understand me," said Asha. Dance with Buckeyes Callie Lacinski and Calder White, who are studying in the highly competitive contemporary dance program at Ohio State. Each year the Department of Dance takes a full program of repertory choreographed by resident and visiting artists, and danced by 50-plus dance majors, to the Capitol Theatre in downtown Columbus. Additional performance opportunities abound including faculty, graduate and undergraduate student concerts in our new state-of-the-art Barnett Theatre and community venues. In addition to the many international study opportunities through the Office of International Affairs, our dance students have specific study abroad opportunities to Brazil, Germany, China, Costa Rica, Denmark and other countries with close faculty collaborations. The Department of Dance fosters many strong interdisciplinary connections throughout the University including the Wexner Center for the Arts, the Advanced Computing Center for the Arts and Design (ACCAD) and Performing Arts Medicine in the Wexner Medical Center (PAM). As BFA students prepare for their senior projects, they frequently augment their dance research by collaborating with faculty in other disciplines such as business, arts management, health services, therapy, social work and theatre. Ohio State dance alumni connections provide rich resources and opportunities for our dancers throughout their careers. The Department of Dance hosts multiple guest artists and scholars each year who give our students ongoing connections with professionals in the field. Also, the flourishing dance community in the city of Columbus offers additional opportunities for our students to expand their network base. Dance majors actively create and participate in community-based projects to share the benefits of this moving art form with a wide range of constituents. 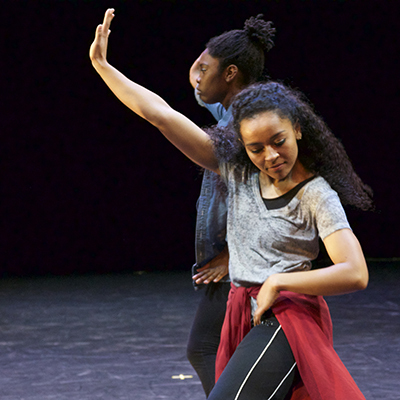 Students have influenced the community through dance by working with prison inmates, cancer recovery patients and advocates of anti-human trafficking. Other examples of outreach range from authoring a nutrition eBook for dancers and athletes to designing and implementing of a yearlong course for public schools exploring dance in a global context.